The user's Advanced tab contains some 'advanced' settings for a VPOP3 user. The Change Internet Mail Reply Address to option will change the From or Reply-To address for any messages sent by this user to the specified email address. This option is rarely needed, because the sender email address is usually set in the email client, but sometimes this can be useful - for instance if you have different internal email addresses from the Internet visible email addresses, or to enforce sender email addresses. The Spam Quarantine Threshold tells VPOP3 when messages should be quarantined by the VPOP3 spamfilter. The spamfilter gives each incoming message a 'spam score', with 'spammier' messages having a higher score. The default is that if the score is 100 or more, then messages will be quarantined, but you can change this for individual users who may want to receive less spam (with more risk of false positives) or have less chance of false positives (so possibly receive more spam). You can disable the quarantine for this user, use the Global quarantine threshold, or set it to a custom value. 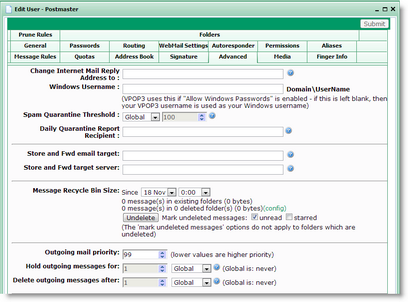 The Daily Quarantine Report Recipient specifies the email address which will receive the report listing messages quarantined by the spamfilter for this user. If this is left blank, then the quarantine report will go to the address specified in the global settings. If that is also blank, then the quarantine report will go to this user. You can specify the special built-in group "no-one" if you just want the quarantine report to be discarded. 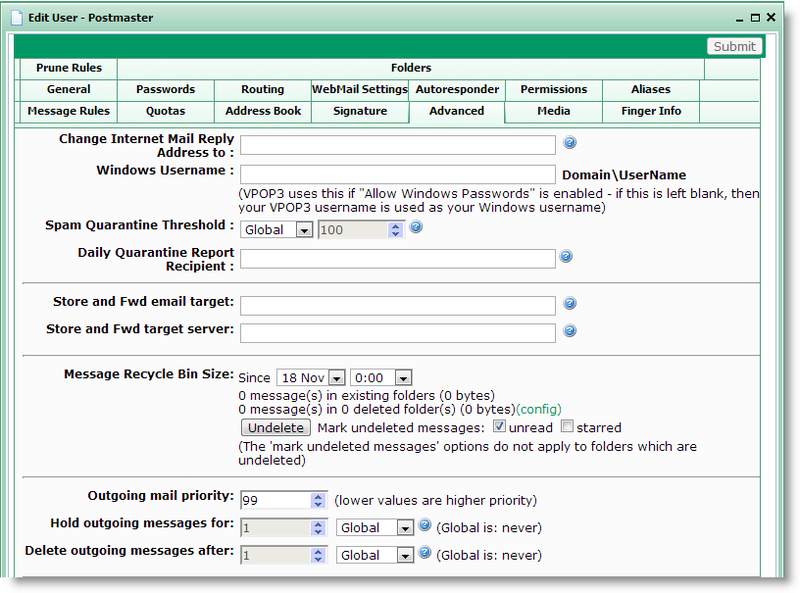 Store and forward is an advanced option where VPOP3 will put a message into the user's Inbox folder, and at the same time attempt to forward it to another mail server using SMTP. This is different from normal LAN Forwarding because the messages are copied to both the user's Inbox and to the other mail server. VPOP3 will then keep the messages in sync, so if the message is deleted from the Inbox folder, it won't forward it to the other mail server, and if the message is forwarded to the other mail server, it will delete it from the Inbox folder. The purpose of this facility is for it to be used as a backup service. For instance, if you have set up this installation of VPOP3 as a secondary MX server, then while the primary server is working, messages will be forwarded onto the primary server, and the local Inboxes won't fill up, but then if the primary server fails, users can access their new messages via this server without any reconfiguration. If and when the primary server recovers, then messages will start flowing to that server again. The Store and Fwd email target setting specifies the email address for the messages to be forwarded to. VPOP3 will use STARTTLS encryption if the remote server supports it, but will not use SSL encryption. VPOP3 Enterprise has a Recycle Bin option, where messages & folders which are deleted by the user will be retained in the message store in a 'zombie' state for a few days. These messages can then be undeleted by an administrator if the user realises they didn't mean to delete the messages. The recycle bin is configured in the Database settings. In the user's settings you can undelete the messages. You select the time just before the desired messages were deleted in the date & time boxes after the Since text. Once you have chosen a date/time, you will be told how many messages & folders were deleted after that time. You can also tell VPOP3 to mark the recovered messages in existing folders as unread and/or as starred/flagged. This will make it easier to find the recovered messages and deal with them. Once you are ready, press the Undelete button to recover the messages. You can tell VPOP3 how to treat outgoing messages sent by this user (these settings do not apply to internal messages sent by the user). If you wish to use these settings, then you should make sure that you require SMTP authentication when sending messages, so that VPOP3 knows which user has sent which messages. These settings can be set on a user basis. A Lua script can override these settings if desired. The Outgoing mail priority lets you prioritise some users' messages over others (lower numbers are higher priority - e.g. messages with priority 1 are sent before those with priority 2). If messages fail and are retried, VPOP3 will adjust the priority so that they move back in the priority list to avoid blocking newly sent messages. The Hold outgoing messages for... setting lets you tell VPOP3 to hold outgoing messages in the Outqueue for a time after they are sent. This can be useful, for instance, if you want to approve some users' emails before they are sent, or if some senders like a 'grace period' after they have sent their messages so that messages can be deleted in case they change their minds. The default value is set in the Misc Settings, but it can be overridden for each user if desired. The Delete outgoing messages after... setting lets you tell VPOP3 to delete a users' messages from the Outqueue if they have not been sent for a certain amount of time. The default value is set in the Misc Settings, but it can be overridden for each user if desired. A related setting is set in the Mail Sender settings as the Max Retry Time, but that only applies when the Mail Sender tries and fails to send the message. This setting will apply even if the message is Held, or no Mail Sender tries to send it. If a message is deleted because of this setting, the sender will receive notification that this has happened. You could, for instance, set the Hold outgoing messages for... to 2 days, and the Delete outgoing messages after to 1 day. Then, the message will be deleted before it is automatically unheld, so an administrator needs to unhold the users' messages within the first day after they are sent for them to go, otherwise they will be deleted automatically, and the sender notified.